Turbo Turf 100 gallon space saver is designed to sit sideways in the back of a pickup truck or on a trailer. The 100 gallon space saver sprayer has the engine on one side and the hose reel on the other. The 200 gallon space saver has the engine and hose reel on the same side. Both use a compact rectangular tank with a large 8″ fill well for easy loading. It can be equipped with a manual hose reel, an electric hose reel, or electric hose reels with Turbo Turf’s Invisible man radio control rewind that allows the operator to rewind the hose without going back to the unit. It comes standard with a hose reel and mount and 300 feet of 1/2″ sprayer hose with a 600 P.S.I. rating. It comes standard with the turbo gun which may be easily adjusted from a cone spray to a straight spray. It is available with a wide range of pumps and engines. 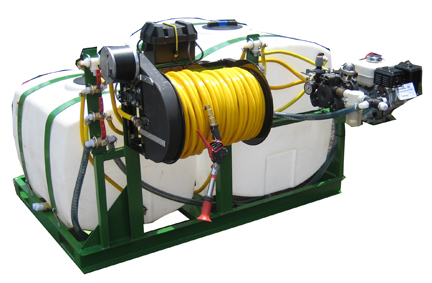 All turf sprayers are designed to be reliable and easy to use and service. There is a front mounted tank shut off and a front mounted tank drain. The 30 micron filter has a convenient easy to reach location and a clear strainer bowl to allow it to be quickly and easy checked. All plumbing is rust and corrosion resistant; The It has a strong frame designed for long life. Space saver sprayers may also be made in multi tank configurations such as the 200 gallon space saver with a second 100 gallon tank pictured below.